The CBDT extended the deadline to link PAN with Aadhaar by six months from March 31 to September 30, 2019. However, it’ll be mandatory to quote and link Aadhaar while filing income tax return from April 1, 2019 unless specifically exempted. In a first three-way amalgamation, Vijaya Bank and Dena Bank will merge with Bank of Baroda to create the third-largest lender of the country. The customers including depositors of Vijaya Bank and Dena Bank will be treated as customers of Bank of Baroda with effect from 1st April this year. The first-ever three-way consolidation of banks in India, with a combined business of 14.8 lakh crore rupees, making it the third-largest bank after State Bank of India and ICICI Bank. Air Marshal NS Dhillon was appointed as the new Strategic Forces Command Chief. Maharatna public sector units GAIL India Ltd and Bharat Heavy Electricals Ltd (BHEL) have inked a memorandum of understanding (MoU) for cooperation in the development of solar power projects. The MoU is aimed at building a closer strategic partnership between the two state-owned companies for jointly pursuing commercial solar power projects through participation in tariff and viability gap funding based competitive bidding process. India has set a target to achieve 100 GW of solar power by 2022 so that all citizens can have round-the-clock access to uninterrupted electricity. In a first, ISRO opened a visitors’ gallery with 5,000 capacity at Andhra Pradesh’s Sriharikota island. The gallery has a clear line of sight to two launch pads and large screens to explain launcher and satellite features. This comes as ISRO is launching defence satellite EMISAT along with 28 foreign satellites. The other 28 international satellites are 25 3U type, two 6U type and one 2U type nano satellites. They are from Lithuania (two), Spain (1), Switzerland (1) and the United States (24). Under the framework of South-South Cooperation, India has offered $100 million Line of Credit to Bolivia for financing development projects. 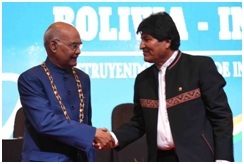 Accompanied by a 100-member strong official delegation, President Ramnath Kovind had wide ranging discussions with his counterpart President Evo Morles of Bolivia. The discussions focussed on political, economic and cultural issues including space, mining, IT, pharmaceutical and traditional medicines. According to report ‘OpenSignal’s Hottest city for 4G Availability’ released by OpenSignal, Dhanbad, which is also known as the coal capital of India has the highest 4G availability of 95.3%, followed by Ranchi which has 95% of 4G Availability. Srinagar is one of the remote areas in the country stood third on the list with 4G Availability score of 94.9%. Federer is now behind only America’s Jimmy Connors with 109 career singles titles. India has lost to South Korea in the final of Sultan Azlan Shah Hockey tournament at Ipoh in Malaysia. The host Malaysia Has secured the 3rd place. Manpreet Singh was the captain of Indian Hockey Team.